"Junketsu + Kareshi" chapter 2 delivers! So we will take this on as a project. Here's a teaser to get you ready for the next chapter. Chapter 83 will release on September 24th in Japanese. The translation will be released about a week later. 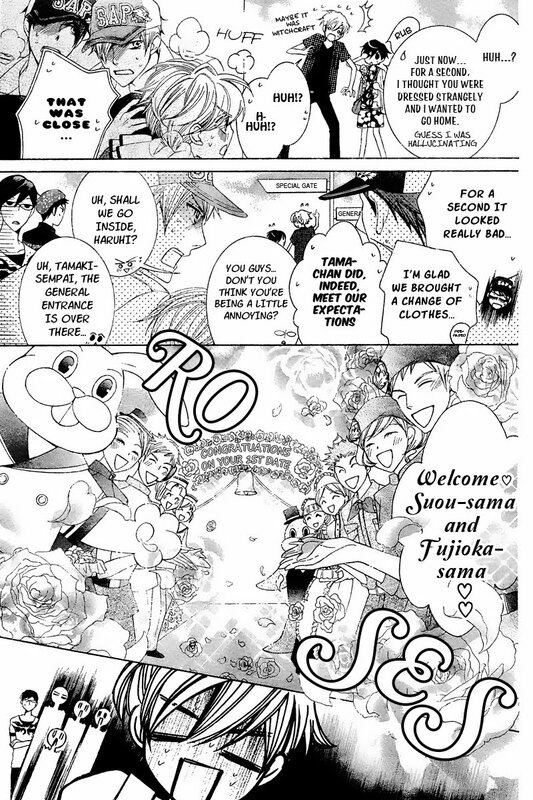 Here is Ouran Chp 82! 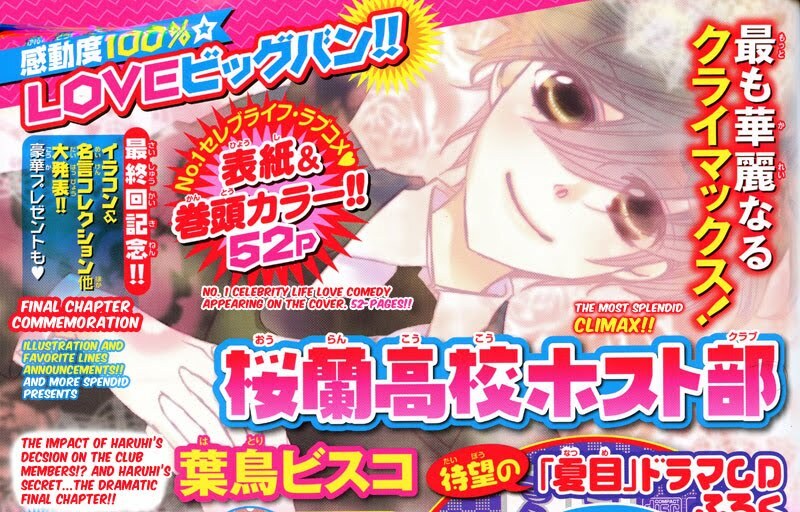 Chapter 83 will be the last Ouran chapter! I know some of you are suffering out there, so here's a little Baka-Tamaki to ease your pain. The image editing in this chapter is more intensive than usual, so it's going to take a little longer than I anticipated. There's pins, an image CD, and a button-looking things among the things to buy. I hope at least one of the many online stores will get some of this merchandise in stock so folks outside of Japan can buy some. Caption: "At this Moment, I feel we can go anywhere together...(heart)"
No kissing, but there's lots of hand holding and "dawwwwww" moments. 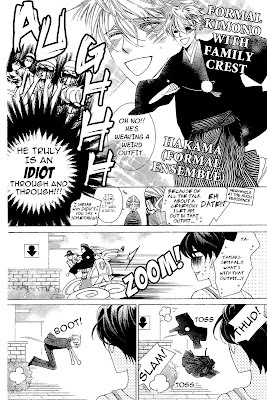 Here's the extra story that comes in between "Seirei Produce" chapter 5 and chapter 6. 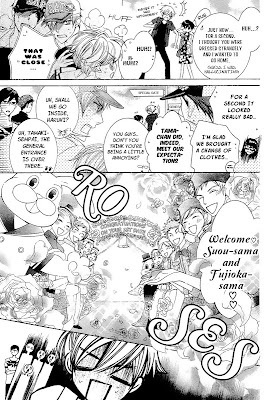 Next up is "Ouran High School Host Club" chapter 82! 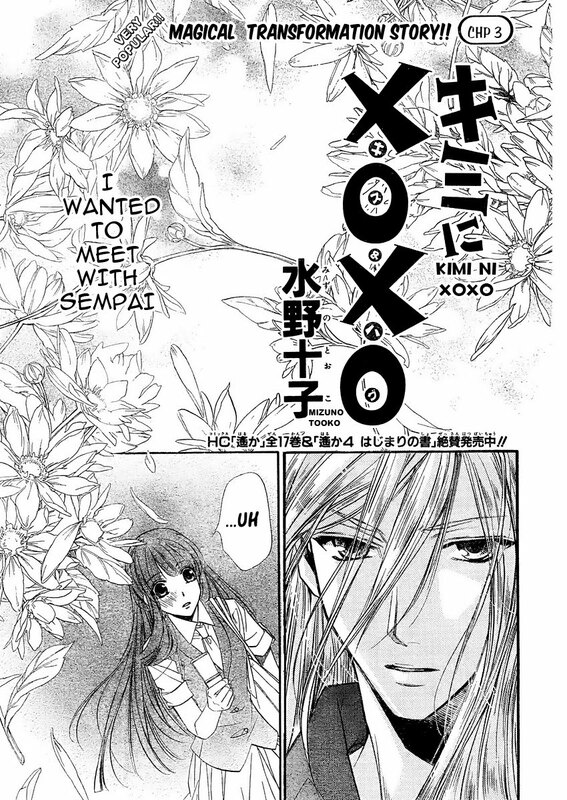 Here is "Orange Chocolate" chapter 16! I want to give a special thanks to our newest proofreader, Holanio. 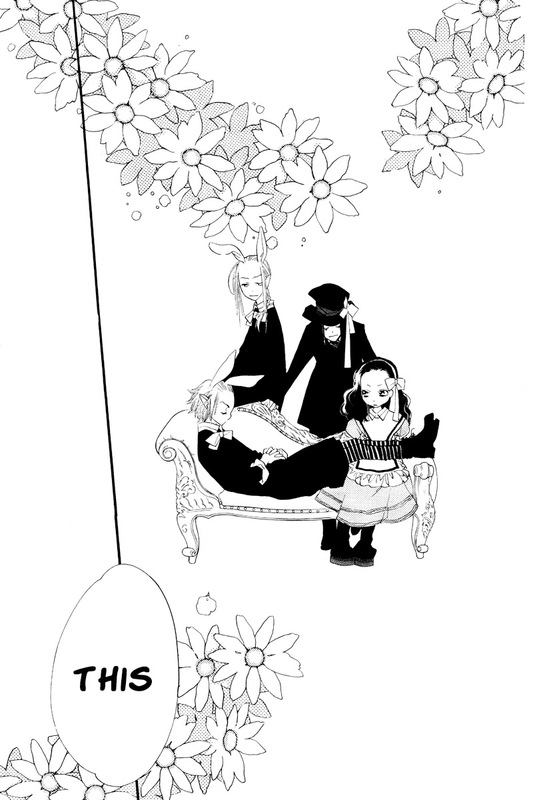 Not much progress is made in this chapter but the second half of the chapter contains some gorgeous artwork. After Ouran, the "Junketsu + Kareshi" and "Pika Ichi" trials continue, followed by "Seirei Produce" chapter 5. 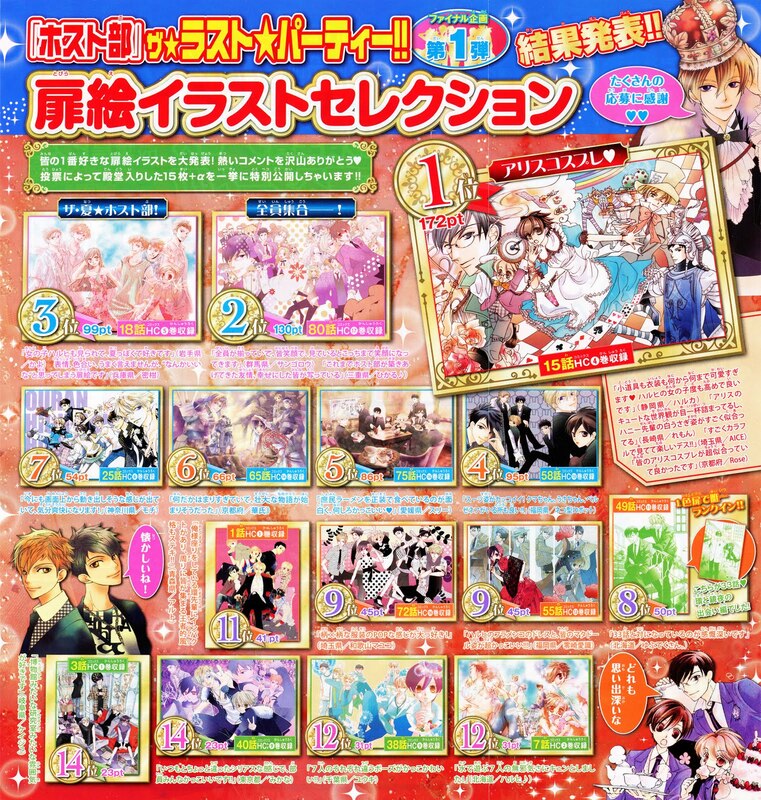 Update: No Ouran freebies are included in Lala magazine :(. 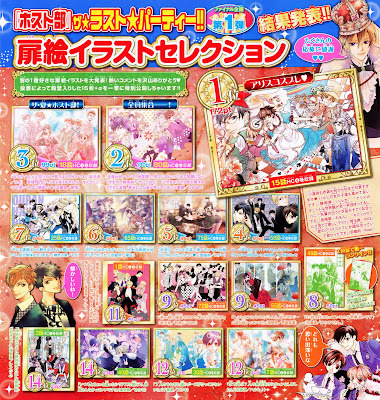 Rather, there are merchandise offers in the magazines. 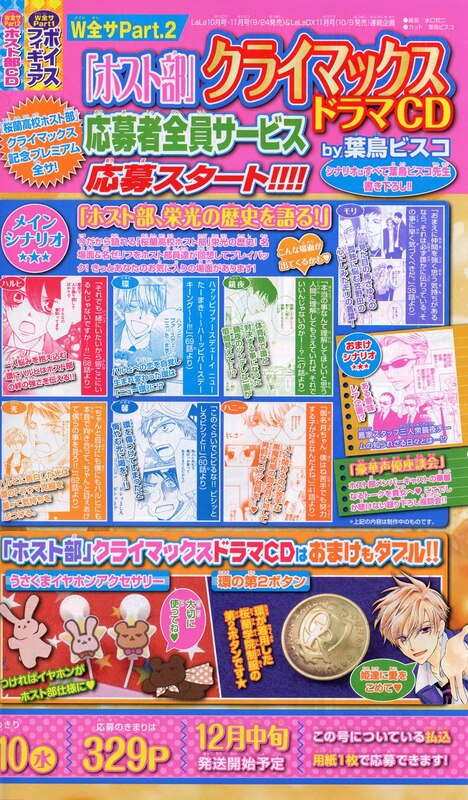 So far there's a set of stamps and the drama CD. 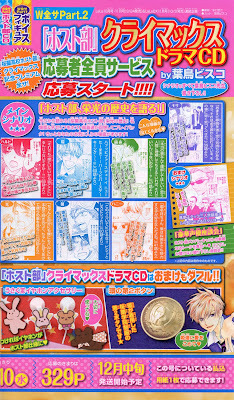 I will ask Akadot if they will be offering any of the Ouran goodies for sale. As I predicted the Lala 10 release date and delivery truck schedule will not align favorably. As I result, indeed, I will not get the Ouran 82 raw until Wednesday. I'm so bummed because I want to know how Ouran will end just as much as you all do. Anyhow, this means I'm sticking to a release date of August 30 :(. If you can't wait, I'm sure another version will be available well before the 30th. Rest assured, though, I will be translating Ouran 82 and releasing it ASAP in all it's lovely glory ;p Until then, please enjoy our other series and one-shots, and maybe, just maybe, I'll squeeze out a little treat before I get started on Ouran. 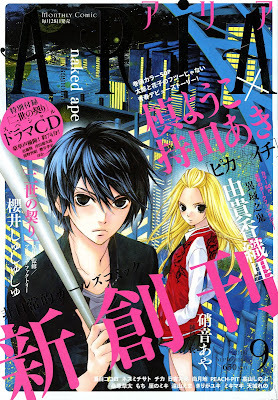 Here are my random predictions for the end of "Zettai Heiwa Daisakusen." I really have no idea what's going to happen, but it's fun to speculate. Johanne is saved at the last moment either by Joshua, the citizens, or military coup. I put my money, though, on a Joshua redemption at which point he can get pneumonia and die in the arms of his personal assistant. Joshua enters the "spanking machine" and at the end is greeted with smack and then a hug from his mother, the Queen. Joshua abdicates the throne after giving up Claspel, Yuda's Dad gives up Canaan to be under the administrative control of Meteora (Canaan is broke and in debt to Judecca) and Jeremiah reveals himself to be a good guy. Johanne eventually becomes the benevolent ruler of Canaan, Judecca, and Meteora and under unification there's finally peace and a railroad to Judecca and Canaan. Here it is! "Zetta Heiwa Daisakusen" chapter 18! This is the second to last chapter. The final chapter releases in Japanese on October 9th and will be a whopping 50-pages! I'm very excited for it and I'm hoping for a satisfying ending. "Afterschool Charisma" Vol. 1 -- I'm so sad about this one. The premise is GREAT! It's about a school filled with the clones of notable historic figures and one seemingly normal guy. But then that premise is rammed down the reader's throat and then pounded into the reader's head with a jackhammer to make sure we understand these are clones of famous people. I think a little subtlety would have been nice. 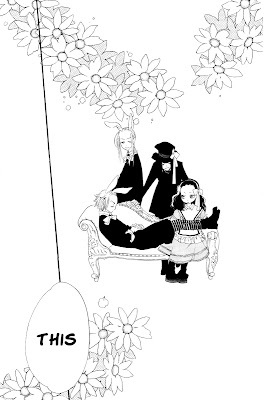 The quiet moments when Kamiya is with Freud and Hitler (of all the famous people to clone...) are quite nice. The rest of it, though, is schlock. I think it also would have been nice to get rid of the obvious villains and the glaring lack of ethics of those villains. I guess I felt this series could have been a whole lot better if it stuck to the nature vs. nurture question and gone with it in that vain. So what if Marie Curie wanted to play music and be in love with the school's founders son? That could have been interesting. Oh! The most excellent thing about this volume was the "All Mighty Dolly." I wants one badly!!! It's soooo cute!!! 2.5/5 I really feel that this one is a matter of taste, so if the premise sounds good to you, you might want to check it out, especially if subtlety is not your cup of tea. Sorry all, we don't find out anything about the pretty boy from the boat...however, as a consolation gift, I promise you a nice close up of Izana (*smokin'*). Anyhow, this chapter appears to be the set-up for the chapter 21 which, according to the previews will be extra long. It's too bad we have to wait until October. I Finally Have Lala DX 9! I finally have Lala DX 9! Yay! 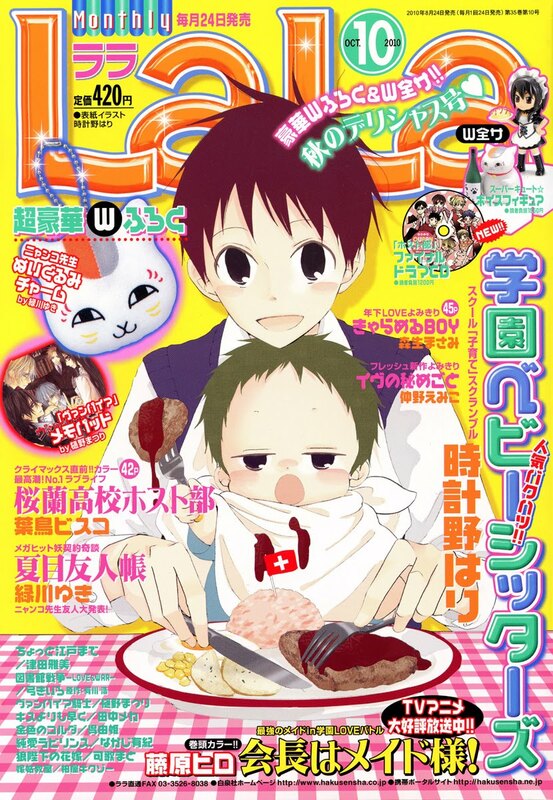 AnS chapter 20 is 40 pages long and according to the preview chapter 21 will be 45-pages long. ZHD chapter 18 is also 40-pages long. I expect this chapter to bring fans much joy :). Chapter 19 will be the final chapter of ZHD and will run 50-pages. And now to get to work on AnS 20! "Junketsu + Kareshi" ("Pureblood + Boyfriend") is another new series from "Aria" magazine. 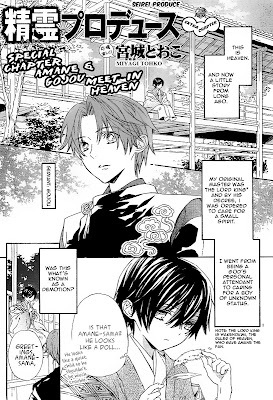 I will definitely be translating the second chapter because I want to know what happens next and the chapter left me with lots of questions. 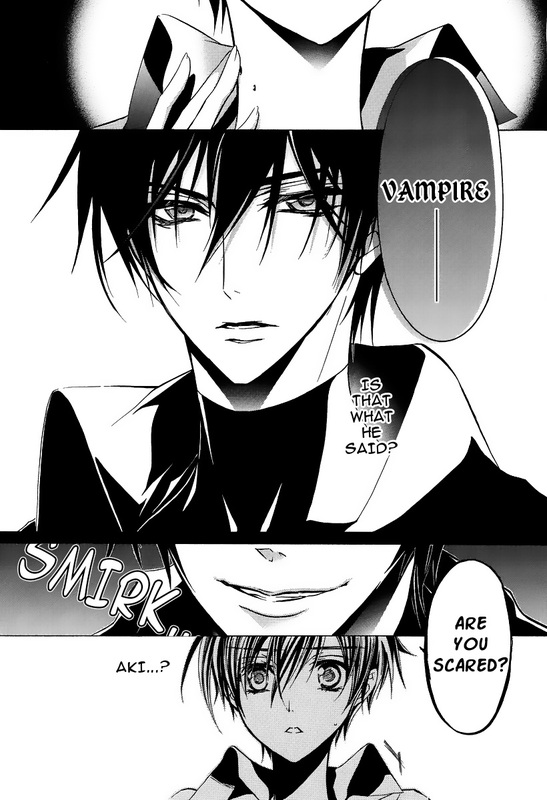 As with "Pika Ichi," I will decide whether to continue this series based on the second chapter. As always, your feedback is appreciated and wanted. This is yet another vampire romance, however, this particular vampire does bite and he may not be a nice guy. 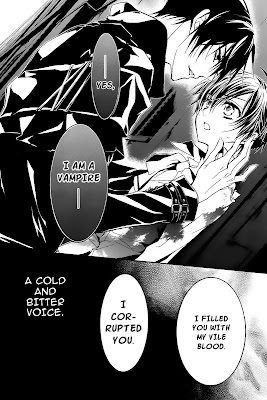 I have a lot of hope for this story because I'm tired of vampires who don't act like vampires. I should be getting LalaDX 9 this afternoon, which means I can finally start on AnS and ZHD. AnS 20 should be released in about a week. I'm so relieved we were able to get this out now. Basically, the raw was so awful that we were having a difficult time cleaning and making the final producｔ look decent. It was such an awful experience that I put things off on this chapter. A few of you, though, wrote in asking when chapter 4 was coming, so I decided to "rip the band-aid off" and get this over with. "Big thanks" to Silver Lunar who shared in the cleaning pain and thanks to Luna for doing the Photoshop filter experiments. 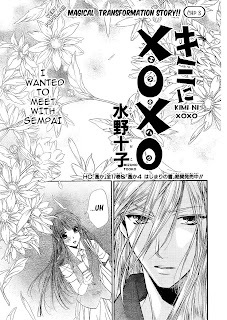 So...chapter 4...we get some more fun with the Kitsune, who name is revealed to be "Fuuta" and a new character is introduced. 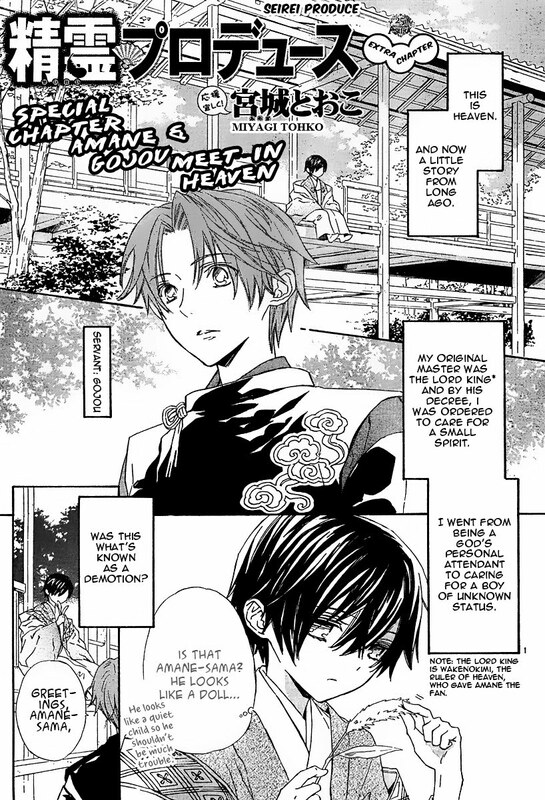 This chapter is basically the set up for chapters 5 and 6 and the chapter 5 omake. 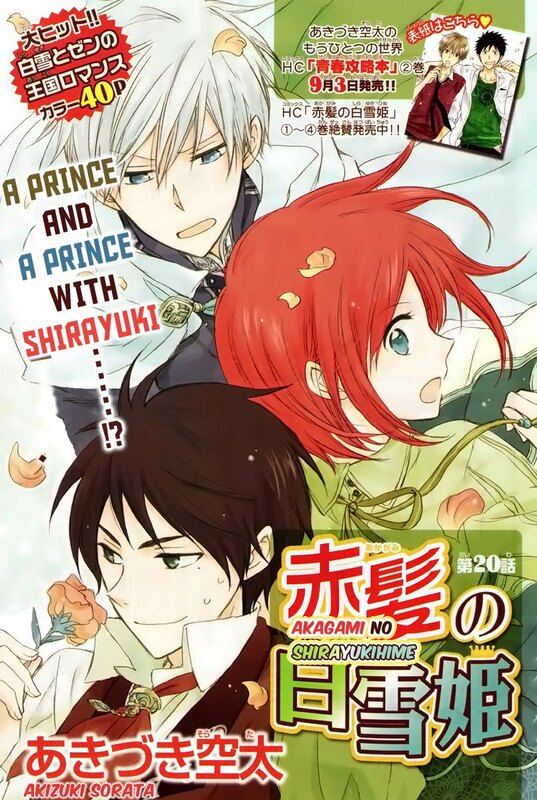 Next up is "Akagami no Shirayukihime" and "Zettai Heiwa Daisakusen." I will pick which one comes first based up which one looks more interesting. 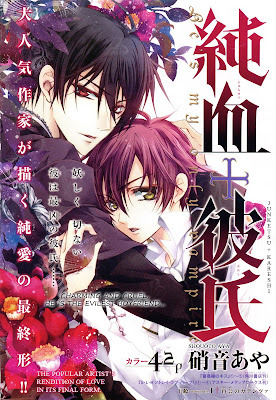 Check out Sapphire Pyro's excellent write-up on Pika Ichi at Hyper-Parfait! 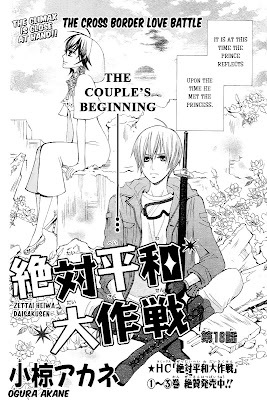 Here's the first chapter of the new series "Pika Ichi" from the new Shoujo manga magazine "Aria." 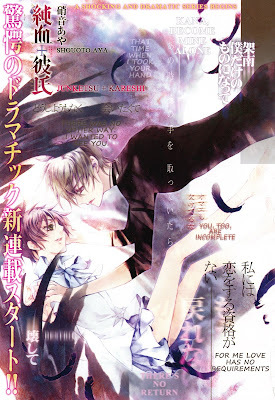 I like the art work and I like the two main characters and the supporting character, but I don't know where the story is heading based upon this first chapter. Therefore, the decision of whether to take on this series will be made after reading the second chapter. I would like to know what you all think about this first chapter, so please leave some feedback to help us with our decision. 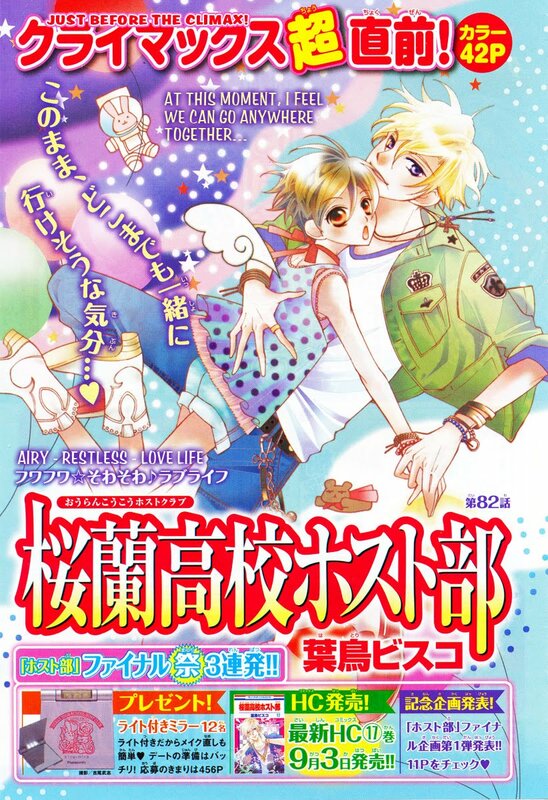 If we do take this on, it will be a joint project with Hyper-Parfait and it will be released monthly after Ouran concludes at the end of September. 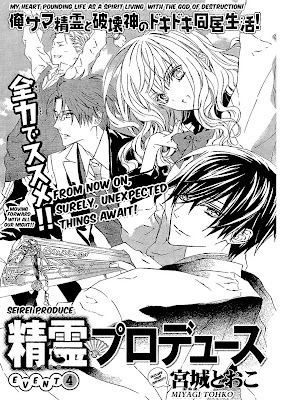 Next up is "Seirei Produce" chapter 4. It looks like we'll be able to sneak this one in before the release of Lala DX 9 on August 10th. I want to get this done now so there isn't such a long gap between chapters. We had another productive month last July! Two new cleaners have been added to the Omari's Sister team. Please welcome Erthyreia and Tedhi :). I now also have some Japanese language help from Sae. Also, say goodbye Sephyna. He did a wonderful job on "Orange Chocolate" but real life calls and he must answer. Let's wish him luck into the future! Also, Lala DX 9 comes out bringing us "Zettai Heiwa Daisakusen" Chp 18 and "Akagami no Shirayukihime" Chp 20. 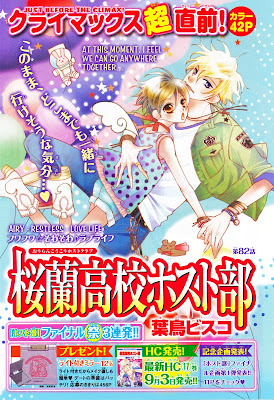 "Ouran High School Host Club" Chp 82 will come out at the end of the month and hopefully between the magazine releases, we will be able to squeeze out "Orange Chocolate" Chp 16. If you wish to purchases some of these titles, please help me out a little by purchasing through my Amazon Storefront, Omari's Sister Recommends. Hopefully we'll find out the answer in chapter 82. 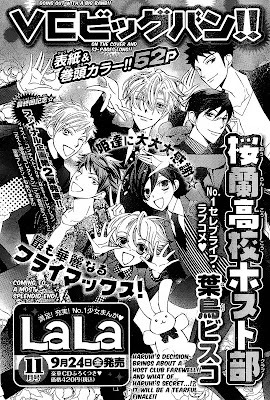 The bad news is the series is going on hiatus and chapter 4 will not come out until Lala 12 which releases October 23rd. I'm sure by then, none of you will care how this short series ends. This is not exactly the best strategy to keep a captive audience. 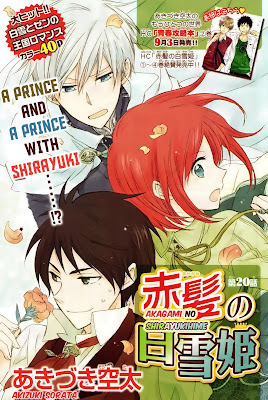 Hopefully, there will be a nice one-shot or special chapter to keep things going until October. Next up is a new series trial. 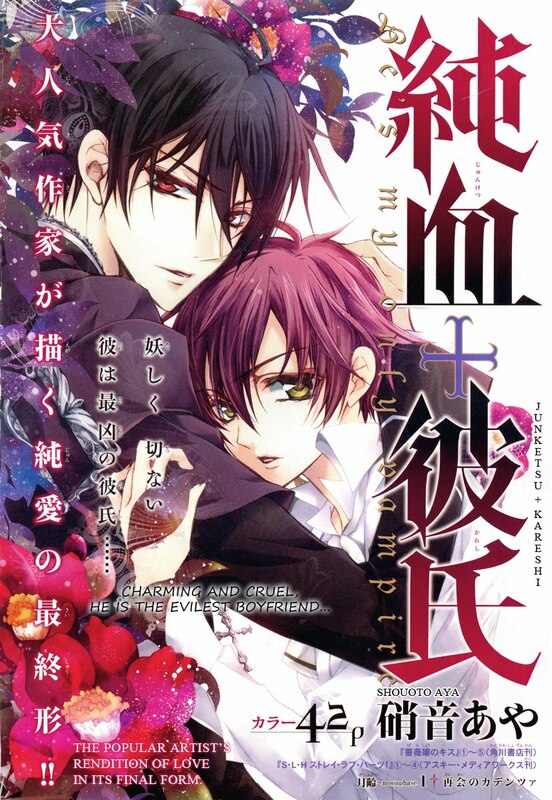 The new series is called "Pika Ichi" and it debuted this month in the brand new manga magazine Aria. My hope is that this series will sate those folks who are suffering from "Arakure" withdrawal.